How has the Ras changed on the past twelve years since I was on it last. Technically the race has really moved with the times. The communication system is very good with the radio system really efficient with the results on the web within an hour of the finish-this is really impressive considering the complexity of the results. The racing is faster than I remember with some very high speeds and selections made such as the day out of Cahirciveen where the leaders climbed an 8 kilometre Cat 2 climb at 40 kilometres per hour on the tunnel road. This was the biggest mistake of the race where the New Zealand team went too fast and were outfoxed by the British and Austrians. The non appearance of an Irish team is a pity however with the new UCI rules it means that it is virtually impossible to find non contracted Irish riders who would be able to compete against the Professional teams. A contracted rider on a continental or Pro Continental team cannot represent another team if their own team is entered in the race so this would rule out the likes of Matt Brammieir, Conor McConvey, Sean Downey, Jack WIlson, Ryan Mullen, Conor Dunne, Philip Lavery and Marcus Christie if Baku or An Post were riding the race. There is limited point in sending a bunch of young 19 year olds to get outgunned by experienced Pros. Race DIrector Tomy Campbell has achieved a good balance of International teams and the racing is at a high level so where does the County rider fit in to the race. Well it is totally right that cat 3 riders are not allowed in the race because riders need to be at least cat 2 before they are ready to ride the Ras in a meaningful way. This was illustrated by the fact that only 3 riders were eliminated for being outside the time limit of 20% this year versus over /0 riders going out last year. So is the Ras as relevant for Irish domestic cyclists as it was in the past when there were 150 Irish riders making up 75% of the field versus now when there are 85 riders making up less than half the field. I would say yes because we are very fortunate if not unique in Europe to have domestic rider access to a world level event. This is a great opportunity for Irish based to race against riders who have ridden the top races like the Tour de France. If a good first or second cat rider prepares properly and is lucky enough to stay healthy and not crash then they can get through the Ras having being in the racing group for most of the week. Looking at the week riders like Damien Shaw, Brian McCrystal, Mark Dowling, Ian Richardson, Eoin Morton, Fraser Duncan, Sean Lacey and others rode well at a high level and if they had a constant level of racing at this level they would be very competitive. 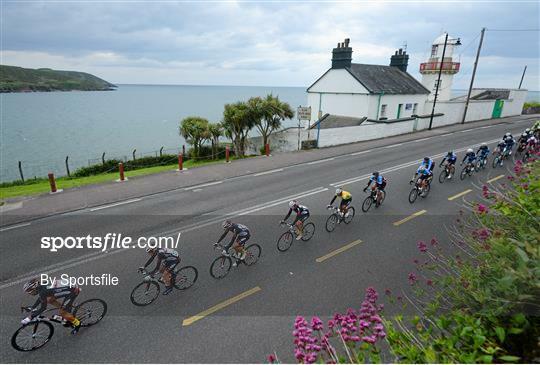 The route every year is spectacular and well thought out and the sight of a number of foreign teams clambering around the rocks at the ferry name hotel in Caherdaniel showed that they were in awe at Ireland’s natural beauty. So what would I change about the Ras in an ideal world? I would love to see the race take place in July, this would give the domestic riders longer to prepare and help the Irish calendar by having time for longer events and more domestic stage races but this may not be possible because of event clashes and high season hotel availability. More circuit finishes would be a real crowd puller as in Skerries but might be logistically very problematic and unpopular with some riders. 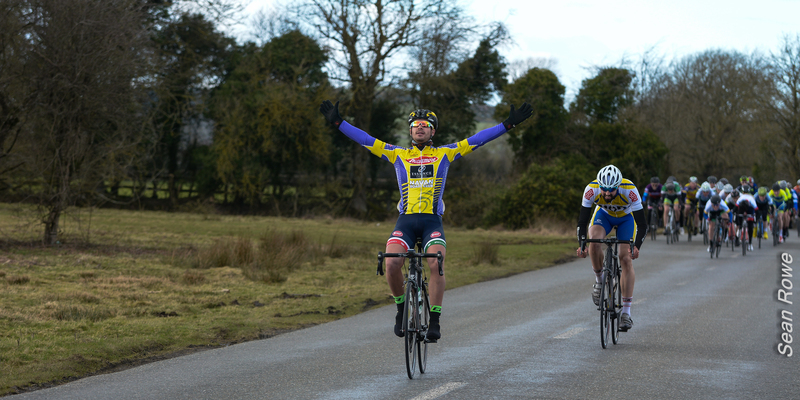 Final Ras Report – Well done lads!! Wow 49 kilometres in the first hour and then they wound it up. It was balls out from the line and after 50 kilometres, Stephen punctured a back wheel and got back on over Dorey’s forge and Dunsany. He did really well because the field was completely lined out at the time. Fair dues to Chris Reilly for getting up the road in the break of the day that was only caught near the finish. The bunch went nuclear on the finishing circuit with the entire field in little bunches over five minutes. It was brilliant to see so any familiar faces along the road and so many Navan jerseys round the circuit. Colm Farrell was surgically removed from his sprayer to cheer the lads on and star of the future Brendan McGuinness was there at the finish with his mum and dad to cheer us on. It was very good to have all five lads finish the race and get their finishers medals. I made Simon go up on the podium. Not only was he brilliant during the week and had a wicked sense of humour but now I have the before picture to submit his application for extreme makeover. Also thanks to Neil Pyne our masseur who did a great job and very special thanks to Micky Kennedy of Cyclize who worked until midnight on the side of the street in Waterford to fix john Kenny’s bike. Hopefully we will be back next year with narrower arses bigger thighs and better medication. In true solidarity with our team mate, we have forwarded his address to the UCI and they will be visiting Trim’n’Healthy Natural Health Foods to test for dubious substances sometime in the next 2 weeks. Now it’s time to admit that the lads were only doing this for training for the Navan club league so it should be fun on Tuesday night. Today was tough 95 miles in the mountains. Just to make things more difficult, it rained really hard for the first hour. This meant that my advice to wear minimum clothes for the first hour resulted in a frozen team with poor Niall doing the shivers in the cavalcade, while we abused him to get back into the group, which he did, of course. Later Simon videoed him descending mount Leinster which is worth watching except for the bit where a remedial team car got in the way and we politely asked him to go into the field. Speaking of abuse, John Murray got fined for politely asking the commissaire to please stop beeping the horn at him while he was on the limit on the climb of mount leinster. After 70 kilometres the climbing went mental with some vicious ascents of the foothills of mount Leinster, causing chaos. The two Johns made it into the big group and the rest of the lads came in just behind them after being misinformed that they were outside the time limit which was 44 minutes and they were only 7 minutes behind the main bunch. Simon, the knob, got the worst sandwiches of the week in Carrick on Suir. Mind you, the apple tart was passable and he said he spotted the best looking schoolteacher of the week, which was a bit of a stretch considering there were no schools open because it’s Saturday. There are now only three Irish teams left with full teams in the race so I am really proud of the lads and the way they have ridden. With a bit of luck we will get to Skerries tomorrow with a full team. It was great to see all the support today with club chairman Matt on top of Corrabutt gap. Hopefully we will see a lot of club members in Skerries tomorrow afternoon. The day started with a drama over john Kenny’s gears and finished with a continuation of the same drama. Just before the start we noticed they were giving trouble so Micky Kennedy got them sorted and all was well until the vertiginous slopes of Seskin Hill where the gears went into the 11 and stayed there. So he lost some time there but he still put out about 3000 watts coming up the 20% slope. Now we have to sort it out. The stage was controlled by the pro teams and all was well until 120 kilometres when the race lined out at 55kph into a cross to headwind and it split into two groups with John Kenny making it into the first split. Earlier both Stuart and Stephen punctured at the same time but they did well to get back on except that we were progressing at 80 kilometres per hour. With Stuart writing his initials on the rear bumper when the ambulance behind the race pulled out in front of us and we completely lost our momentum. We heard Stuart politely asking the ambulance to please vacate the planet. It was a bit like racing in a cold shower for an hour with no waterproof or warm gear on. Loads of guys came out the back in the last 20 kilometres shivering on the bikes in the February-like conditions. Our lads changed on the side of the road then huddled in Volvo heat inside the car during the one hour traffic impeded transfer to Clonmel. In fairness to them they never complain but when you hear delirious sandwich fantasies you know they are beginning to go under. Tomorrow is a real mother of a stage there are only 127 riders left in the race with only 4 Irish teams still with 5 riders left thankfully we are still one of them and hopefully they will all make it home. John Kenny is now on the first page of the classification sheet and if it was a power output race he would be leading overall.